With RPI B+ and RPI 2 the access to the Interrupt at user level is a problem as the response time is changing due to schedulling policy. For this reason the best way is to use a kernel driver : here you can find the elements to make a kernel driver for RF433 to do this. By the way, this post have all the information you need to get start but basically you should loose some of the message due to scheduling. Kernel driver should fix that. The hardware is a simple raspberry PI with a 433Mhz receiver like this one. The reception quality is not the best you can get, but the price is really low cost. I’ll test different receivers in a future paper, so follow my feed to get these results. The rule is to get an AM/ASK receiver for 433,92Mhz (usually call 433 receiver). This article compares the different receivers I used. The receiver is working in 5V, as the RPI GPIO are 3.3V I had a voltage division on the output. You can also use a 3.3V receiver which is what I’m doing now. You can optionally add the led on the reception pin to see data and noise reception. Here is some schema of what I made. The 10K and 15K resistor are transforming a +5V output into a +3.3V to be GPIO compliant. The 1K resistor and Led can be removed they just indicate what is received from the 433 receiver. The strange stuff on the left side is the antenna. The specific Oregon Scientific decoding is operated by another library RcOok made for Arduino, I mostly update this library to make cleaner code and adapt it for C++ and RapsberryPi and add the RCSwitch codec in it. A thread is waiting for the Interrupt flags to get the decoded data and analyse these data to extract sensor element from it. The result is the sum of each quartet (1+D+2+0+1+2+0+0+5+0+2+0+6+5+5) = 42 = 0X2A. As the number of quartet is odd, the program add a CRC8 quartet computation at the end. This CRC is working correctly on this device, but on a second sensor THGN132N this is not working. That’s why the check has been removed in the code. 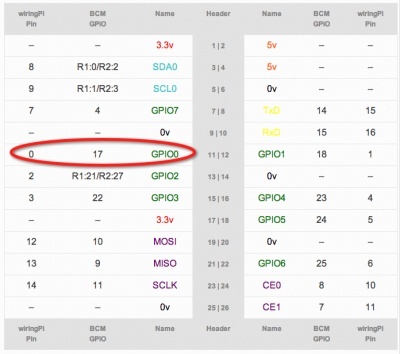 Check if the GPIO configuration is the right one depending on your schematics. you can also add a led on the Receive PIN. if not blinking, it means your receiver is not receiving anything. If blinking, you should have some interrupts. Ok, I had all interrupts, but decoding is not working. In RcOok library the variable “state” is always UNKNOWN. But I found the true code from the 433 MHz module with my oscilloscope. Also you should add, that 5V output in Rasspberry is very noisy. The most of modules can work with 3.3 V power supply. Personally i’m using a 3.3V receiver but I experience good results also with other 5V receivers. If not decoded, did you use one of the Oregon devices listed as supported in my source code ? I did not test all the Oregon protocol (V1,V2,V3) but I did not had any issue with the one used by the tested devices. Can you give me a hint how to compile your modification? I get an compiler exception based on constructor with 0 arguments in send.cpp. Against which version did you modify the sources? and the other question is how to use your sensor decoder? compile it as an output file? Hi Stefan, my source code is not a global project but an extract from a bigger one i can ´t provide entirely. So you have to build your own main file / call the function provided. I m really busy by the global project but soon as i will have some free time I will publish a fully usable package. I have tried your code (with some adaptations) and it works like a charm. I will update it in terms of OS v3 decoding capacities. By the way, the code is quite CPU consuming: do you have the same experience and hints to limit that consumption ? Assuming cpu consumption is related to irq frequency the quality of the receiver is important to reduce noise. By the way, I did not look at this so much. First thing : in your trace I see HEZ + CRES + OSV2 Frame detection, it means that you have activated all the decoding system. It seams that the same message can be interpreted different way depending on decoding engine. If you are using Oregon, you can activate only orscv2 to simplify and optimize. As I wrote it w/o had compiled this peace of code, don’t hesitate to correct my bugs ! i, Will deactivate all other decoder , than Oregon. What should I do to fix this please? Another question RXPIN and TXPIN are the pins used following the wiringpi numbering? Take a look to the RFRPI post. It should also work with you design and the githum code is containing the Makefile to build it. I think this should solve your issue. For RXPIN & TXPIN you right. could you tell me if it is supposed to work with the temperature and humidity sensors of Ninjablocks ? I did not test, for sure it won’t work directly asis. Modification are needed. The ericnosense code has some problems in getIntFromChar() function. Paul, when do you think you will publish the new version ? this is great work, many thanks; I managed to get everything working and wanted to give something back. So I did a little modification and added json file output to test.cpp (so you can now build a webpage with a dials etc.). Thank you Dave for your input. I planned to do something like this soon, so you’ve made most of the work ! thank you. thanks for these great webpresentation. I allso want to receive the signal of a 433MHz weathersensor. I´ve installed thewiringPi and 433Utils and it looks great. So now, i do not understand how i can use your libs, i´ve replaced the origin files of RCSwitch with yours and I also copied the Rc0ok-Files to these directory, but how can i use it? is this a new version of your tested receiver? http://de.rs-online.com/web/p/low-power-funkmodule/7424484/ And can this be used by the PI, too?! THX. This is another one, but it could be compatible, just be carefull with I/O voltage. Je cherche à décoder les indications de température et humidité de mes sondes THGR328N, mais pour l’instant, je n’y suis pas parvenu. La raison principale étant sûrement que je n’y connais rien en C/C++. … et pis c’est tout. Où est (sont) l'(les) erreur(s) ? check reply to next question, it is the same one. Thanks a lot for this good job. Hello, THGR328N is not yet supported in the code, do not hesitate to add it and create a pull request. I assume it should be something like another thermal/hygro sensor. I do not have this sensor to add it so if you offer me one, I’ll add the code. En suivant les indications, j’ai essayé d’interpréter mes trames. ???? : 4 (me demande bien à quoi cela peut correspondre). Thank you for your feed back, do not hesitate to create a pull request or sending me your code back to merge it in the main for other users. …et sincèrement désolé pour les posts multiples… ai pas tout compris. J’ai un peu avancé dans le décodage des trames des THGR328N. En fait, mis à part le code “Device Id” dont le premier caractère change à chaque émission, la structure globale semble identique à celle des trames des THGR122NX. En ajoutant quelques “case 0x?CC3 …”, dans lesquels le ? est remplacé par l’un des caractères apparaissant le plus souvent dans ce device Id (à savoir A, B, C, D, ou 9) dans le switch(iSensorId), appelant la fonction decode_ THGR122NX(pt), je récupère bien la température et l’hygrométrie. …mais je n’ai encore aucune idée de l’utilité du caractère précédant le checksum. Voilà… et merci encore pour tout ça ! I have an Oregon sensor RTHN318, that broadcast temperature, humidity and the atomic clock time received from the DCF77 signal. Below there is an output of your software. The output was captured the 31 October 2014. Do you have a plan to integrate the decoder of this type of sensor? If you want, I can post more output logs. Hope this saves someone 50euros. La tension du signal sur la broche data du recepteur dont vos mettez le lien serait de 2.5v (hackspark, Receiver Data Output: High – 1/2 Vcc, Low – 0.7v) est-ce qu’il faut quand même convertir en 3.3v ? Thank you francis for your feedback. 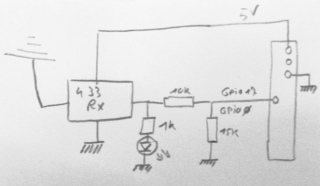 No need to convert to 3.3V as 2.5V is equal to HIGH as 3.3V in the GPIO point of view. Anyone manage to decode the OSV3 rf signal. Does this seems right? need more information like : sensor type and corresponding values to start reversing. I just found the correct code to compute the CRC8 at the end of the THGR122NX message. There was an error in the function : the instruction “oCRC ^= c;” should be after the test, so the ID is completely ignored. With the init value of 0x3c the correct CRC8 is compluted for all my sensors. Can you provide a code or better explanation. I don’t quite understand what you mean. I’m trying to make my own transmitters but can’t figure it out. I’ve a THGR132N sensor, a cheap 433MH reciever and a Raspberry PI B+. I’ve compiled your sources (and DaveBlack one) but I don’t have any output: led is blinking, interrupt is working but it seems that there are any message to detect. I’ve uncommented #define SENSORDEBUG and #define SENSORTRACE without effect. Do you know if with B+ model RcOok timing is working? With RPI B+ and RPI2 you may have trouble as the scheduler is acting during the reception of the frame and in many case it will disturb emission and reception. I do not recommend to use my code on RPI2 and RPIB+ By the way, it should work but not every time, so your problem can be somewhere else. I started working on a kernel module and another solution but yet not finished as I have many thing to work on in parallel. I’ll update the post when a solution will be here. Thanks for your great job Dave. I managed to get it work on my RPi B 2. Another question, which kind of antenna do you use for RF 433 cheap module (433MHz-Superheterodyne-3400-RF-Transmitter-and-Receiver-link). I got this one from ebay but I only have a 1 meter signal range with a simple wire plugged to the antenna pin. I’m testing this with a THN802 Oregon Temperature Sensor which doesn’t send Humidity. It runs on OoK OSV3 but the data length isn’t 80 bits long. I notice in the RcOok Class that for the V3 pulse function, the function expects 80 bits of data to enable the OokAvailable flag. This is not the case for the THN802 sensor which doesn’t send Humidity data, so the length for this sensor is 68 bits (the BCD values are 12 bits long, so 12 bits less in this case). Someone might come across this too, with sensors that have more or less data. Does it work with a rpi pi Zero ? Hi Paul, thank you for posting up this detail. The sensor is on it’s way out (as you may be able to tell), I’m wondering if you have been able to successfully encode any of these sensors (probably in C++, similar to your above work)? I’m trying to perform it in Python, but from the transmitted waveform, it looks like I’m running into hardware issues, where during transmission the IO misses a few beats, which corrupts the signal. Have you had any luck at this? Happy to share this python code if you want to bounce some ideas. Following up on my note; I remembered how I accomplished this for other RF devices (powerpoints, fans) and the workaround was to send the code multiple times (I’m told this is also called “repetition coding”) as the hardware doesn’t form the signal properly every time. So using your decoder, I was able to successfully read the code sent from the RPi [finally!]. I sent it around 20 times (that’s 20 pairs of code, as each code is sent twice with a 10.9ms spacing), and received it 4 times. This send/receive ratio didn’t change by much over testing this in multiple ways (eg. changing channel, changing temp/humidity/rolling code), but right now I can only assume it is indicative of the very cheap RF transmitter I’ve bought, as I know (and can see) the GPIO can run much faster than 1024Hz without losing quality.